Or view larger version. Bong, a Chinese vegetable vendor with two baskets of fresh produce. ca. 1890s. Unknown photographer. Photograph. Collection of Oakland Museum of California. 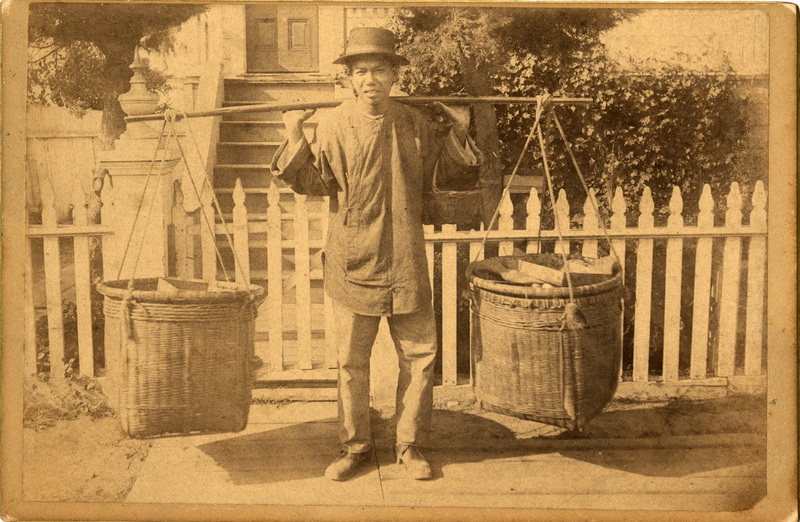 This is a photograph of Bong, a Chinese vegetable vendor who sold fresh produce and fish door-to-door in Berkeley, California at the end of the nineteenth century. Vegetable vendors like Bong carried upwards of 100 pounds each day in two baskets suspended from a carrying pole. Chinese vendors, known as the Basket Brigade, were the only source of fresh produce in the East Bay until the late 1800s.